Entrance Verandah is a roofed open space, in front of the House that leads into it. Vaastu Shastra, an ancient Indian Building Science developed thousands of years ago, lays down guidelines on the design of a Verandah. The basic principle of Vaastu Shastra is to bring about harmony between man, nature and the built environment by the correct location of the different spaces and the building in the Site. 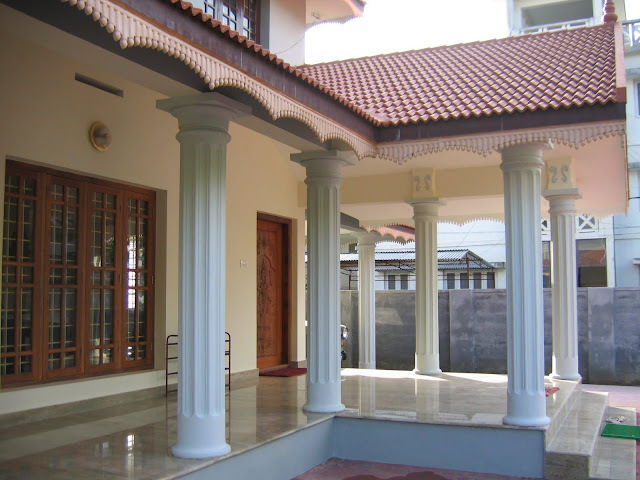 Here, are some of the Vaastu Guidelines to be considered when designing an Entrance Verandah. Preference: East or North portion of the house. Avoid: South or the West sides of the main building. The corners of the Veranda should not be cut or rounded. Heavy furniture and seating should be placed in the South-West portion. If there is a Swing in the Verandah, it should be in the East-West axis. Light plants and flowers can be placed in the North-East portion. Flower pots in the Verandah should be small in size. Avoid flower pots with Creepers in the Verandah. A shoe rack, if needed, can be built or placed in the North-West portion. The height of the Verandah roof should be less than that of the main building. The roof should not be made of tin or asbestos. The Verandah should have maximum number of windows opening into the rest of the House. This exercise is just a guideline to help you decide, where to position the Entrance Verandah in your house plan. In case you already have a house, then this exercise will help you to evaluate the location of your Entrance Verandah, as per Vaastu Shastra principles. Accordingly, you can decide if you want to make some corrections and changes to your house. Note the score for the following question and enter it in the score sheet. The points indicate how favorable your House or Plot is, according to Vaastu.